Explore our catering menu full of delicious sandwiches, salads, soups, snacks, breakfast, and beverages. Box Lunch sandwiches and salads – got it! Sandwich trays, group style salads, group style soups – got it! Breakfast trays with pastries, croissants, hot breakfast sandwiches, and bagels – got it! Coffee service, iced tea, hot chocolate – got it! We always prefer talking to our customers about their event needs and helping you come up with a great selection at the best price. 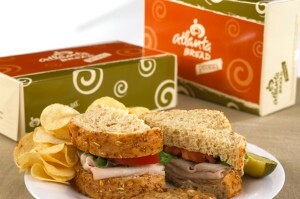 Call a catering expert at (256)922.2253 or email us at catering@atlantabreadhuntsville.com. Let Atlanta Bread Huntsville Catering take care of you and your catering needs. That’s what we do! When you have a group meeting all day (or all week), you need to make sure the group has enough food, on time, and with high quality, freshness, and variety. We know it is important for you to make these events come off flawlessly, whether it is a last minute small group lunch meeting or a multi day, multi functional conference meeting. We are proud to be called on to take care of these events and make them come off without a hitch and do so with a minimum of your time planning it out. Just tell us how many, how much, when, and how often. Our catering experts will put together a plan for your events. You just review and adjust it. If you already know exactly what the group will need, we’ll do it exactly the way you want it. Regardless of the situation, we take care of everything you need. We want you to think of us as the part of your team that reliably takes care of the food and beverage. Need something a little different? Let us know what you want and we will put it together for you if we have the capability. You can always choose from our standard sandwich and salad trays, box lunches, hot breakfast sandwich trays, beverage service and pastry trays that we produce for events small and large. We’ve fed groups with 1000’s of box lunches to the big boss’s board meeting with silver service. We know that last minute needs pop up out of thin air, especially with some bosses. Call us. We will do everything we can to help you feed your group. You can count on Atlanta Bread Huntsville to be reliable and flexible. Looking for the perfect business gift or gift to another office for the holidays? Our Gift Baskets are a unique gift which will be put to use and gone the day you give it. 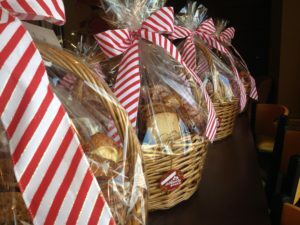 Our gift baskets are composed of fresh baked pastries, cookies, and muffins. When you give an Atlanta Bread Gift Basket, your basket is baked the day you give it. Nothing could be fresher. When you walk into the door and hand some this gift smiles will abound and it is sure to be opened and enjoyed immediately. Atlanta Bread has many gifts suitable for professional gifts, business gifts and gifts for neighbors even the folks at your doctor’s office. For more information click here or call us at 256.922.2253. Need someone who can set up for vendor lunch time sales in your building? Learn more. 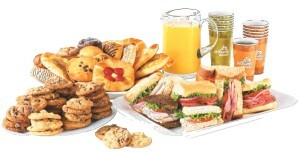 Atlanta Bread Huntsville has catered business events locally for over 14 years. We are business owner/ operators involved with planning and fulfilling your catering order details. Rest assured your event will be on time and feature the very best, freshest food.Learn the details of planning a catered event – Top 10 Tips for choosing a caterer and planning your meal.